Hank Cooper is left his friend Ben's bar / bait shop In Thunder Point, after he dies in Virgin River. Sarah (search and rescue helicopter pilot) and her younger brother, Landon have also just moved there and there is an immediate connect between Cooper and Landon. Sarah and Cooper find themselves in a romance while Gina (single mom) and Mac (the local deputy) add a secondary romance to the mix. There is a mystery surrounding Ben's death and between this and the introduction and set up of the new location, the local love life is pushed a bit to the background until the last part of the book. Oh, and Landon even at sixteen, wasn't left out of the romance department which added a fun element to the story. Carr has done it again, borrowing a bit from her Virgin River series to get this small town romance set up and filled with hope for more to come. Her stories always have a bit of humor mixed in with a mystery to keep you wanting to know what happens next. They are usually pretty addicting and I have read the last once through out the years. Most of her characters become old friends and I have high hopes for this new series. I really want to visit the new locations since the coast in Oregon sounds so inviting. Mac and Gina will be the focus of the next installment, The Newcomer. Thunder Point Oregon sounds like a beautiful place and I bet this is a great book to read especially on a cold grey day.. 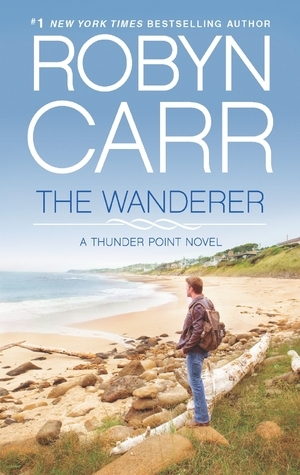 I'm a big fan of Robyn Carr and her Virgin River series and am eagerly looking forward to her Thunder Point books. Sounds like a great read! I like a mix of humor and mystery too, with a dash of romance! Oh Boy! A new series to look forward to! Love her Virgin River series and I'd love to start this new series with The Wanderer. Thanks for the chance. April 2nd entry - thanks! This book sounds fantastic. I love Robyn Carr. Thanks for the great giveaway. April 3rd entry - thanks! April 4th entry - thanks! I love Robyn's books and this sounds like another winner. Can't wait to read it. Thanks for the giveaway. April 5th entry - thanks! April 6th entry - thanks! April 7th entry - thanks! I love Robin's books, and this one sounds wonderful. I'd enjoy reading it. Thanks for having the giveaway. Daily entry 04/08 Thanks for the giveaway. April 8th entry - thanks! April 9th entry - thanks! April 10th entry - thanks!